Add egg yolk, vanilla and almond extract; mix well. Add flour and salt; beat well. In small bowl, beat egg white lightly. Dip each ball first in egg white, then in nuts, rolling to coat. Using index finger, make indentation in middle of each cookie. Bake 25 minutes and remove to wire rack. 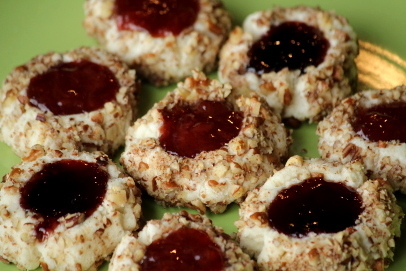 While cookies are still warm, put a dab of preserves in each indentation.